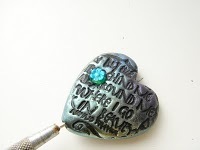 Make some fabulous heart pendants using this step by step guide. 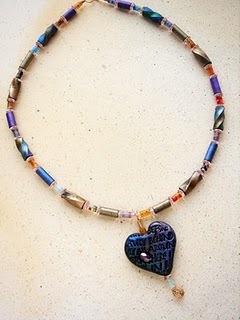 These hearts by Marie Segal go with the spiral metallic tube beads. Condition the clay. 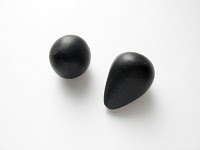 Roll a 1" ball of black Cernit. Then roll that in to a chubby teardrop. 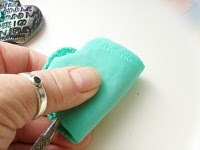 Flatten the rounded end with your thumb and forefinger just a little. Do not smash, just flatten a little. 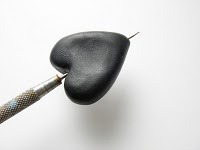 I am using a knitting needle here to make the indentation in the top part of the heart, I hold the pointed part of the heart and roll the knitting needle point from the front to the back. 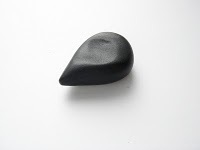 I then with my fingers adjust the lobes of the heart until I like them. 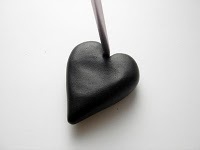 With the needle tool you are going to "drill" it in to the bottom of the heart and keep "drilling" until it comes out in between the lobes in the top of the heart. Drilling by rolling the needle tool back and forth between your finger and thumb keeps the needle from sticking. "Drill" the needle tool out of the heart and flip the heart from end to end and place the point of the needle tool in to the hole in between the lobes of the heart and "drill" it to the other end of the heart. 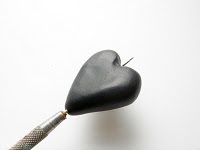 Leave the heart on the needle tool like this. 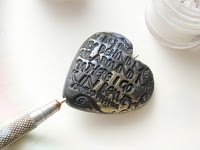 Lay the heart on one of the stamps and place the other stamp on the top of the heart. 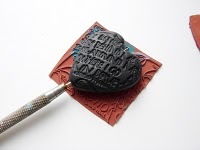 Press the stamp down around the heart gently but firmly.You can even go around the edges a little. Pull the stamp off and check it out. If it is not deep enough you may have to do it over again. Roll the heart into a ball again and start from the beginning. Place a very small(very small) amount of Pearl-ex powder on the plate. Some times I just take it out of the lid. Rub the powder in to the heart gently. For the multicolored heart I just add little patches of this color to the heart. I used Interference blue, Interference red, Interference gold, interference violet and interference green. I use a circular motion to apply the powder. 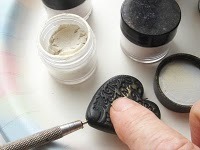 I also go over one area and keep rubbing gently to force the powder into the surface of the clay. Keep adding the colors until the heart is covered front and back. Get a small glass bead and cut a small piece of wire about 1" long and thread the bead on the wire. Place the bead in the middle of the wire and twist the ends together, tight to the bead. With the wire cutters cut off the ends of the wire leaving a 1/2" tail. Bend the twisted wire in to a little hook. 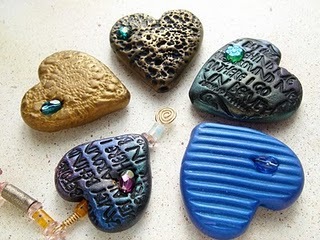 Insert the twisted end in to the clay heart. I put mine on the left hand side of the heart. 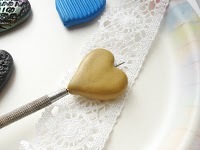 I leave the heart on the needle tool to make sure I do not put it in to the hole that runs vertically through the heart. 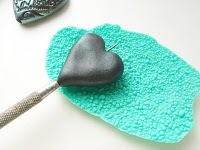 With a flexible silicone texture plate, I lay the heart on the needle tool on top of one side of the texture plate. 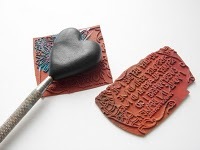 Fold the other half of the texture plate over the heart and press the texture plate together. You can even do this between your palms. 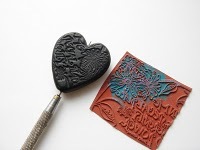 With corrugated cardboard pieces lay one of the pieces of the cardboard down, place the heart on the needle tool on top of the cardboard the way you want the lines to impress. 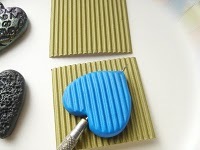 Place the other cardboard over the top of the heart and press them together gently and firmly. Peel them off. 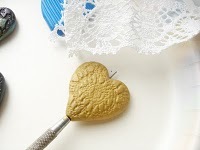 Now, with a piece of cotton lace, lay the lace down, place the heart on top of the lace with the needle tool still in it. 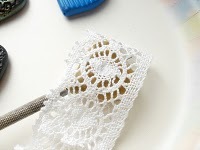 Place the other end of the lace over the heart and press the lace in to the heart on both sides. With something this flexible you can press it easily around the sides too!